AL030 Features: -Power tote.-Carries manual folding wheelchairs.-One-switch operation.-Unique, adjustable hold-down arm.-No chair modifications required.-Ball mount standard, upgrades available.-Folds when not in use.-Weight capacity: 100 lbs. 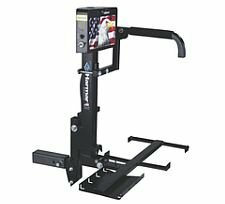 Includes: -Manual crank backup and license plate mount included.-Hitch post included. Options: -Swing-away option available. Dimensions: -Dimensions: 43” W x 13” D.
Buy Power Tote at Discounted Prices ✓ FREE DELIVERY possible on eligible purchases. AL030 Features: -Power tote.-Carries manual folding wheelchairs.-One-switch operation.-Unique, adjustable hold-down arm.-No chair modifications required.-Ball mount standard, upgrades available.-Folds when not in use.-Weight capacity: 100 lbs. Includes: -Manual crank backup and license plate mount included.-Hitch post included. Options: -Swing-away option available. Dimensions: -Dimensions: 43'' W x 13'' D.